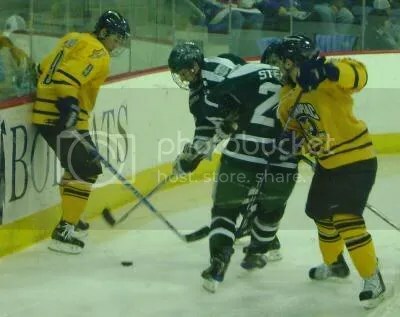 HAMDEN, CT- The Dartmouth Big Green traveled down to Quinnipiac University to take on the host Bobcats on November 14 for an ECAC contest. Going into the game, QU was undefeated in the league, and Dartmouth had yet to pick up a win. At the end of the game, that was still true as Quinnipiac picked up the win 4-2 in a penalty filled affair in front of a raucous crowd at TD Bank SportsCenter. The initial goalies were Jody O’Neill for Dartmouth and Dan Clarke for the Bobcats. It took 53 seconds for Quinnipiac to score as Jean-Marc Beaudoin assisted by Scott Zurevinski and Zach Hansen got the puck past O’Neill and it was 1-0. A Quinnipiac penalty on Clay Harvey a minute later did not stop the Bobcats from a shorthanded chance and they killed the penalty successfully. The Big Green’s Alex Goodship went in the penalty box at 4:26 for goal tender interference and Zurevinski got one past the keeper for a power play goal assisted by Greg Holt and Reese Rolheiser. Another Dartmouth penalty on Doug Jones for boarding gave the Bobcats another power play and they took their shots but a goal did not result. Dartmouth then proceeded to unleash several attacks, but they were stopped one way or another. Mike Glaicar was called for interference at 11:16, but Dartmouth not only could not use the power play, Joe Stejskal went in the box for cross checking a minute in. Neither side benefited and in fact QU’s Brandon Wong went in the box to wrap up the Dartmouth penalty, and Quinnipiac killed their time as well. At the 16:30 mark, Spencer Heichman struck assisted by Glaicar and Harvey to get the home team up 3-0. A penalty on Eric Lampe gave Dartmouth another power play but they did not capitalize as a minute in Adam Estoclet was caught tripping at 18:13. QU did not score on their power play either and the period wrapped up with QU’s 3 goals and 15 shots to Dartmouth’s 0 goals and 9 shots. When period 2 started up, James Mello was in goal for Dartmouth. Ben Arnt got called for hooking at 3:06 and the Big Green went on the power play again, this time scoring with 1 second left in the as Dustin Walsh scored assisted by Estoclet and Jones when a scrum in front of the net gave them an opportunity to make something happen. Matt Reber was called for holding at 6:29 though the Bobcats could not score on their power play. Play continued for awhile until Dalhuisen was called for hooking at 12:22 though the Dartmouth power play lasted just a few seconds before Peter Boldt went in tht ebox for interference, and just a few seconds after that QU’s Davies went in for interference as well. Dartmouth would take advantage and Scott Fleming assisted by Kyle Reeds and Jones scored at 14:54 cutting the lead to 1. No more penalties or goals would follow in the period. In Period 3 an early penalty on Glaicar gave Dartmouth a power play, but QU killed it. At 7:21 Zurevinski scored the only goal of the night past Mello to regain a two goal lead. Multiple penalties would follow, but Dartmouth didn’t get on the board again, and Quinnipiac picked up the 4-2 victory.